With a circuit design based on early 1960s American tube amplifiers, the Fusion 1102 is a blast from the past. Small in stature, but not in performance, the JD102CRC has a big heart, delivering a surprising amount of juice even into difficult loads. With four inputs and both a 4 Ohm and 8 Ohm tap, the Fusion 1102 is quite flexible. We've used the Fusion 1102 on efficient tower speakers, inefficient bookshelf speakers and everything in between with great results. The elegant understated appearance works well with virtually any system and the small form factor makes the Fusion 1102 a great alternative to solid state or digital mini amps. Besides, the golden glow of those seven tubes will warm your heart, but not your room! Tube Complement:4 pieces Electro Harmonix EL84 power output tubes; 2 pcs. Electro Harmonix 12AT7A driver tubes, 1 pc. 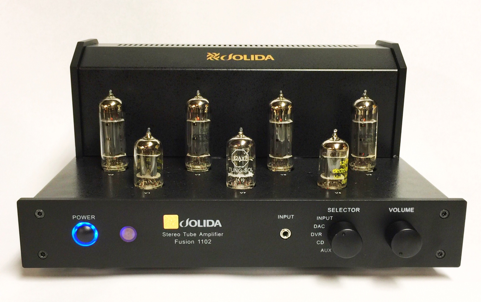 Tung Sol 12AX7 pre-amplifier tubes. Dimensions: 12 inches wide by 8 inches deep by 5 inches high. Construction Details and Features: Fully Integrated Stereo Amplifier: Input 800mV driving 20 watts, maximum 25 watts output.